This plain terrace garden in Hornchurch was in need of modernisation. There was little of interest, so Earth Designs was asked to create an attractive terrace for entertaining. Turning a plain terrace in Hornchurch into a relaxing idyll, perfect for entertaining. 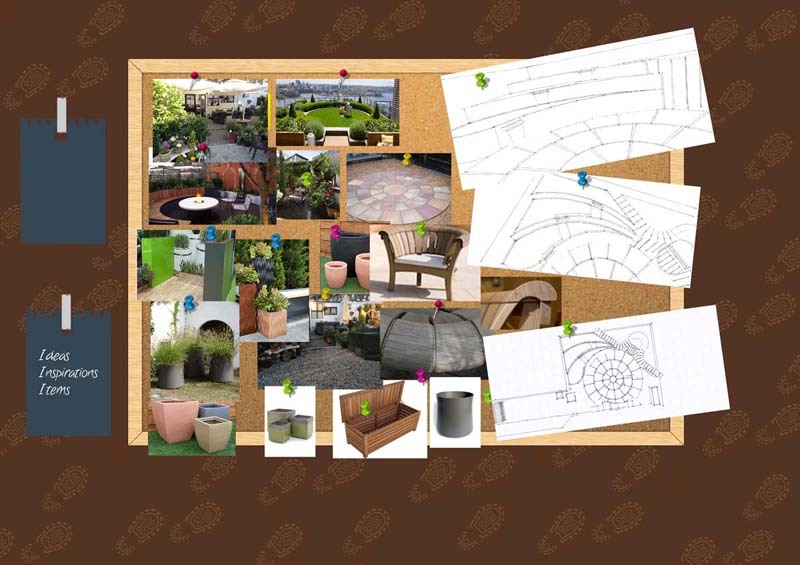 For her terrace roof garden design, the client wanted it to have a deeply lush and verdant feel, whilst being fairly low maintenance to maintain. She also wanted to be somewhere that her and her friends could enjoy spending time. At the moment, the space is quite plain, with tiles and a few pots with plants. It feels very stark and the client wanted us to make it more interesting and relaxing. 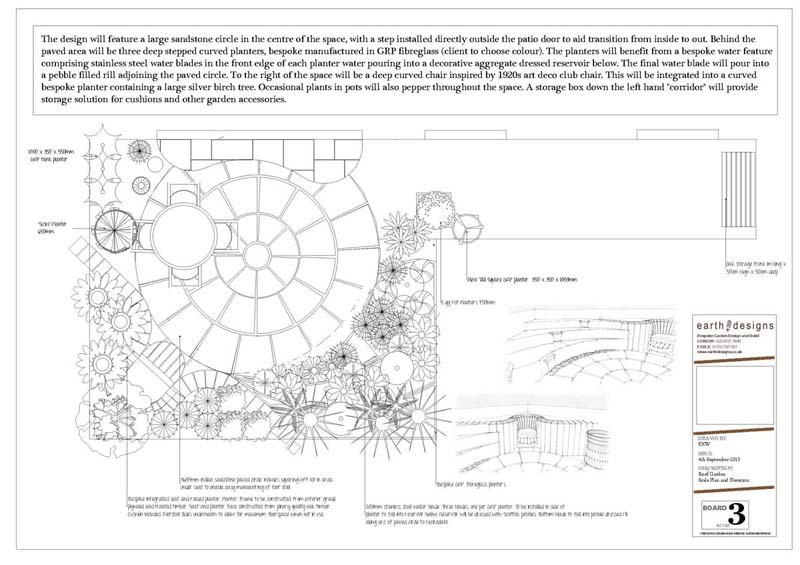 The design of the terrace roof garden will feature a large sandstone circle in the centre of the space, with a step installed directly outside the patio door to aid transition from inside to out. Behind the paved area will be three deep stepped curved planters, bespoke manufactured in GRP fibreglass (whichever colour the client would like). The planters on the terrace roof garden will benefit from a bespoke water feature comprising stainless steel water blades in the front edge of each planter water, pouring into a decorative aggregate dressed reservoir below. The final water blade will pour into a pebble-filled rill adjoining the paved circle. 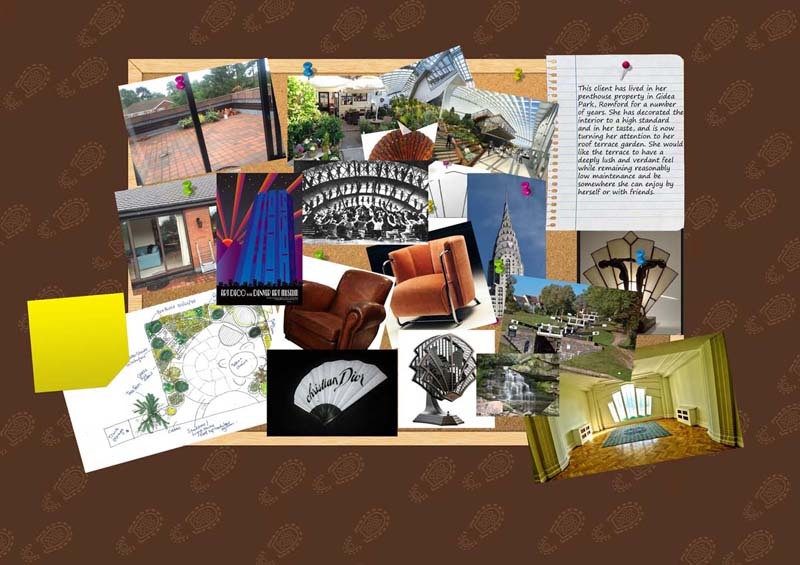 To the right of the terrace roof garden will be a deep curved chair inspired by 1920s art deco club chair. This will be integrated into a curved bespoke planter containing a large silver birch tree. Occasional plants in pots will also pepper throughout the space. A storage box down the left hand ‘corridor’ will provide storage solution for cushions and other garden accessories. This terrace garden will feature lots of manmade materials such as fibreglass combined with sleek stainless steel water features, natural stone and aggregate. This brings an organic nature to the garden, juxtaposed with the harsher manmade materials. 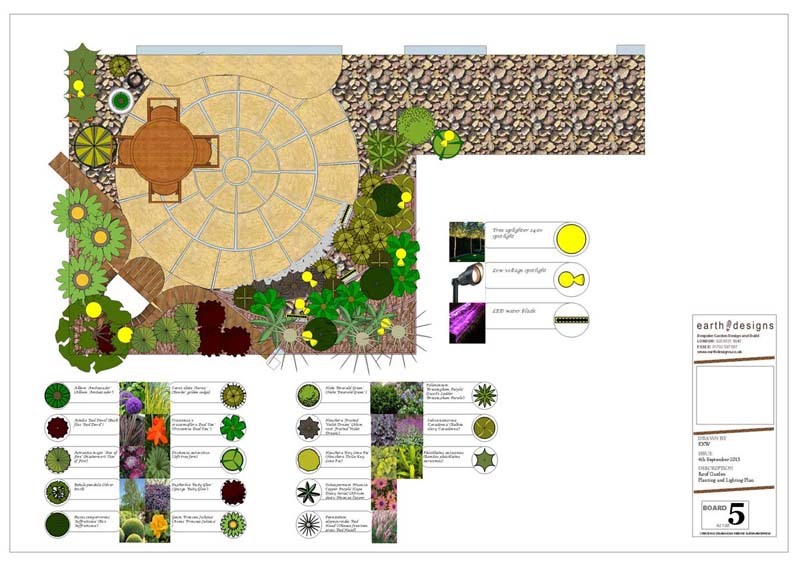 The colour scheme is yet to be decided by the client, but it’s likely to be neutral shades rather than bright and bold, with lots of greenery rather than colourful planting. 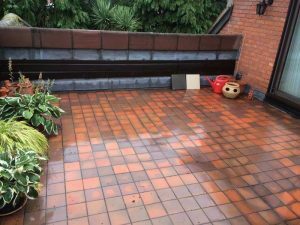 The planting scheme in this terraced roof garden are focused on textures rather than colour, although we have designed it with various shades of green, dotted with purples and muted pinks. Alliums will give the garden height, while Chinese fountain grass will give some movement in the breeze. Other suggested plants include hebes, salvia and astelia.